Hockey Allstar Shootout: are you an Allstar? 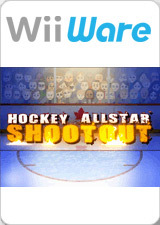 Use the Wii Remote controller as a stick and take the shot as you compete in three exciting Hockey Skills Challenges. In Head 2 Head, it’s just you versus the best goalies in the world in a five puck shootout! Race against the clock to post the most goals in the fastest time! The three difficulty levels will place you against three increasingly talented goalies, each donning the jersey of their home country. In two-player mode, each player will take a turn as shooter and as goalie and the player who scores the most goals in five shots is the winner. In Sharp Shooter, you post a high score in one of three difficulty levels by breaking as many targets as you can. Each time a shot fails to break a target, an X will appear in the upper left corner. Three misses and the game is over. Power Shot has you take your best shot and watch the Shot-Speed Clock light up. You have three attempts to blast the fastest shot you can and only the best speeds will grace the high score list. The graph below charts the compatibility with Hockey Allstar Shootout since Dolphin's 2.0 release, listing revisions only where a compatibility change occurred. This page was last edited on 18 January 2018, at 00:53.